One-click conversion of any PDF file into an editable Microsoft Excel document! PDF-to-Excel is a program that allows you to convert Adobe PDF documents into MS Excel® format with a minimum loss of formatting quality. Password Protection to ensure confidentiality of your documents (up to 256-bit encryption for files that require a high level of security). Permission rights management: set permissions to print, copy or edit PDF files with different levels of authorisation. 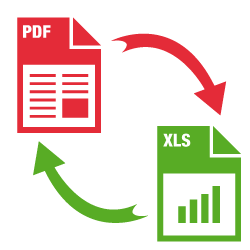 Batch conversion allows you to convert a large number of Excel documents into separate PDF files, or merge them into a single PDF file. Choose “PDF to Excel” as the export format.